Learn how to make a gingerbread house with your children this Christmas and you'll create memories that'll last a lifetime. You can easily make awesome gingerbread houses from scratch that are beautifully decorated and can add an old fashioned, homey warmth to the holiday. You can also use Grandma's gingerbread cookie recipes to make accessories for your house such as gingerbread men, trees, and a cobblestone walkway. The decorations are fun to add, and they'll bring your house alive and help to hide any tiny flaws. You'll be amazed at how good it all looks when you're done. Homemade from Scratch or from Kit? Should you choose one of the gingerbread house kits that are popular these days, or make your own from scratch as Grandma did? It's a decision faced by many parents. Back in the 1950s when I was a youngster, I helped Mom decorate our gingerbread houses, but that was after she had drawn a brown-paper pattern and had carefully cut the house parts from the homemade gingerbread. Today's kits make creating the gingerbread house easier for kids, but it was fascinating to watch Mom do it all from scratch. Not a Christmas goes by that I don't think of those old gingerbread houses that Mom and I made together so many years ago. Those homemade gingerbread houses were so much fun to decorate with icing and candies, and although it was sad to see the Christmas holidays end, I always looked forward to eating them. I simply LOVED the unique taste of that stale gingerbread and icing. To a kid, it was absolutely delicious! Yes, the kits are convenient, I will give them that, but making gingerbread houses with Mom was something extra special. Mix all ingredients together, chill for 1 hour, cut house pieces, and bake about 15 minutes in a 350°F oven. You'll also need 3 whipped egg whites and 5 cups confectioner's sugar for the Royal icing. 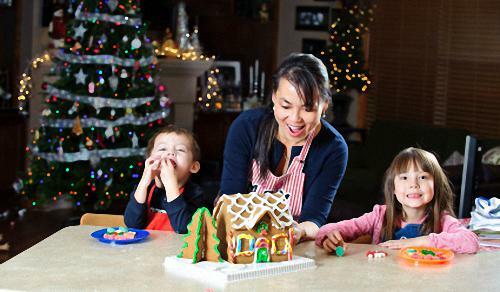 Here are some easy-to-do ideas you can use for decorating your gingerbread house to make it look extra special. Carefully cut window openings in the gingerbread walls, and through an open back window, insert a small string of clear LED Christmas lights into the house to light up its inside. When the lights are plugged in, they'll give a soft glow to the gingerbread and reveal a sparkly light through the windows. To make clear, glass-like gingerbread house windows, melt one cup white sugar in a pot over low heat until it's completely melted. Continue heating until the candied sugar is at the hard crack stage, then pour it onto a lightly buttered pan. If you prefer amber-colored glass, let the mixture heat to just a wee bit past the hard crack stage. When the candy glass has cooled slightly, use a sharp knife to cut window pieces to size, then use icing to secure them in the house's window openings. Food coloring can be added to make candy windows of any color. Leftovers from the candy glass recipe will make a frozen pond or creek next to the house, and large pine trees can be cut from either gingerbread or sugar cookie dough, then decorated and baked with sparkly green sugar crystals. Bits of broken gingerbread can make a cobblestone walkway or lane. 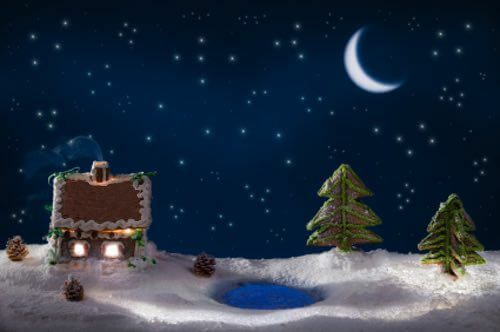 The homemade gingerbread house, trees, and pond can all be set on a large serving tray lined with white cotton batting to resemble a snowy forest scene, with a large sheet of dark blue Christmas wrapping paper positioned on the wall behind for the night sky. It will look magical in a dimly lit corner of the room. Adding decorative touches as these will bring admiring looks and compliments. It will appear so creative and original. 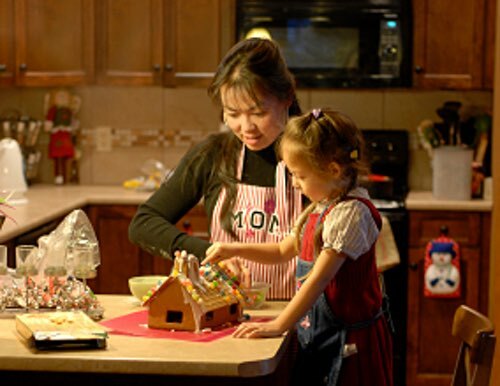 Show your children how to make a gingerbread house this Christmas and start a wonderful family tradition.